In the Maptek Vulcan software, triangulation validity is an important aspect of the three dimensional shape. The volume of a closed solid and the block model reserves are both dependent on the triangulation being valid. Invalid triangulations may not return accurate volume or reserve information. 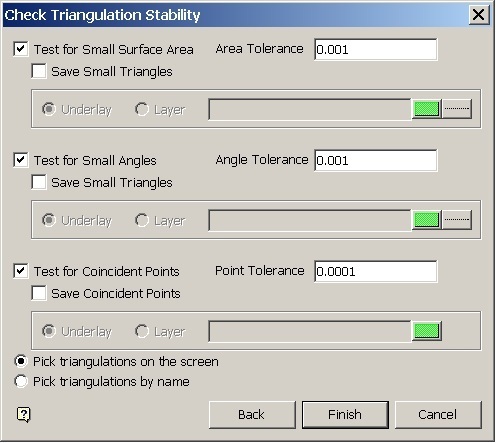 Triangle validity in Maptek Vulcan consists of three tests: Closure, Consistency and Self-Intersection. Two of the tests are fairly self-explanatory. A closed triangulation is like a basketball, it has no holes in it through which air might escape. A self-intersecting triangulation has triangle facets that intersect one another. Consistent triangulations are a little less intuitive. Triangulations which pass the test for consistency have no triangle side that is shared by more than two triangle facets. The closure test has a similar requirement that each triangle side be shared by no less than two facets. Inconsistent triangulations usually happen when two triangulations have been clipped (or booleaned) against one another. The intersection has pinched out and then opened up again. The side where everything intersects is now shared by four triangle facets. Fortunately, these inconsistencies are usually found at the edges of the triangulation and are easily ‘cut’ out of the solid using the Model > Triangle Utility > Cut tool. To test a triangulation for validity you can use one of three menu options: Model > Triangle Utility > Check, Model > Triangle Solid > Check or Model > Triangle Edit > Check. Interestingly, the Model > Triangle Surface sub-menu has no Check tool. Depending on the context menu settings you may also right click on the triangulation and select Check. 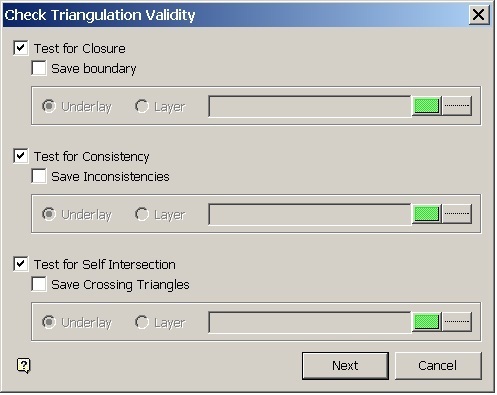 In the ‘Check Triangulation Validity’ panel you may select which tests to perform and, subsequently, whether to save the boundary of the failure. All three tests are selected by default. When I save the boundary of the error I always select to save to a layer. The layer is easier to work with than an underlay even though you have to remember to delete the layer later or have a lingering layer in your database. After clicking ‘Next’ the ‘Check Triangulation Stability’ panel is displayed. Stability tests are not required to calculate an accurate volume or reserve. If you look at the test, the stability tests intlude a tolerance value. Presumably, you could set the tolerance to something so small that each of the tests (small surface area, small angles and coincident points) would pass. Also included in this panel is the option to select triangulations on the screen or by name. If by name is selected you will be prompted to browse for the triangulations to test. That’s it, by clicking ‘Finish’ you can test all the selected triangulations for validity and stability. Just a quick tip. When I test a large number of triangulations for validity I always de-select the stability tests. These tests are not required for validity and this way I won’t get a long list of failed stability tests, just any validity failures. Hello, My name is Yanko González, I am a 10 years experienced Mining Engineer with knowledge in short, medium an long term mine planning. I´d like to ask you, Have you ever try or check what really happens when we calculate reserves with triangulations are not validated? is there any measure about the accuracy I get with this "several hours of validating job" Sometimes We don´t have the time. Passing the triangulation validity tests ensures that the volume and reserves you get from that triangulation are correct. 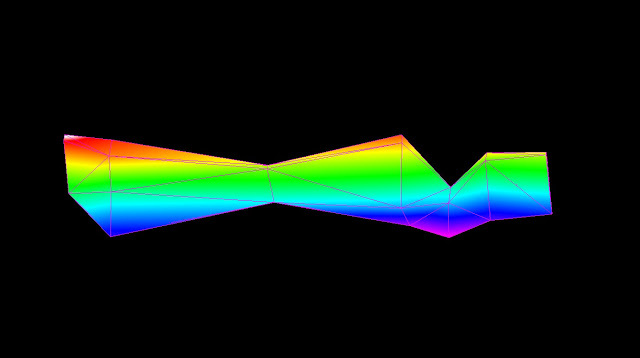 Sometimes an invalid triangulation will give the correct reserve results (sometimes it gives an error or a result of zero) but nobody (namely Maptek) will stand by those results unless the triangulation is modified to a valid state.